Marvel Writers: Michael Avon Oeming, Daniel Berman Art: Andrea DiVito As much as it breaks my mortal heart to say it, Thor just isn’t cool any more. Was he ever hip, or trendy, or with the times in the way that Spider-man or Wolverine maintain popularity? The fair haired God of Thunder has always been a character many readers have been unable to take serious, ever at odds with the rest of Lee & Kirby’s clay footed heroes. It’s easy for us older readers to reminisce fondly about the Son of Odin, but the world of Asgard does jar with the grim, cinematic direction Marvel is taking its franchises. At only six issues long, Thor’s demise feels like the horribly rushed episode finale TV writers are forced to devise upon discovering last-minute that their show has been cancelled. Loki has gained control of the mold that forged Mjolnir itself, and, equipping an army of Thor’s past nemeses with the weapons it produces, begins a path of death and destruction across Asgard that will bring the realm closer towards the ever-impending Ragnarok. After an intriguing prologue, Michael Avon Oeming wastes no time in decimating Asgard and its finest warriors. The book reads like a hit list of Thor’s supporting cast and antagonists. Thought the latter half does find some direction, it’s a little late to care; Marvel clearly doesn’t, casually culling a large chunk of Thor’s comrades – many of whom have served alongside him for more than thirty years – in several pages. Mercifully, the book’s strong central concept, that the Norse Gods are to endlessly repeat a cycle of life and death that will decline in vivacity with each reiteration, is fascinating enough to sustain the cramped plotting. In our current storytelling climate, where popular characters are recycled and reconceived, killed and resurrected on an annual basis, it’s also relevant. Thor has always been a cheesy, dare I say embarrassing, character, but that’s always been his charm. The best writers have exploited this aspect without compromising his dignity. Unfortunately, Oeming scripts his characters like the last thirty years of comics never happened. “This is the horror of war” Captain America spouts upon finding an orphaned child in a battleground graveyard of thousands. It may also be the first book published in years with frequent and earnestly applied thought bubbles. 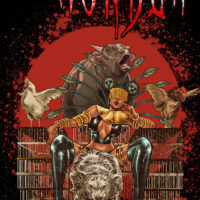 Andrea’s DiVito’s art, however, is for the most part exceptional, adhering to a traditional, fine lined comic style with a comparatively understated palette. He illustrates Asgard with a clarity and scale that the title has often lacked. The Avengers will return, but whether the Son of Odin should rejoin them, or indeed whether they deserve his aid, one can only say when Marvel inevitably dusts him off in several years time. Iron Man, The Hulk Were awesome. Their my favorite characters from the avenger. 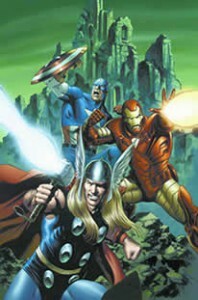 The Avengers movies coming out soon i cant wait.